Soup Time: Butternut Squash Soup with Chilli & Creme Fraiche Recipe. Remembering what a wonderful mix of vegetables I had bought from a shopping expedition at my favourite Waitrose shop in Willerby, (using my special money-saving coupons), my mind trawled through the list: Leeks, Fennel, Carrots, Cavolo Nero, Parsnips, Butternut Squash …… now … wait a minute … did I buy Butternut Squash or did I imagine it? … no… I did buy it. Hurrah! Next stop, have a look for interesting soups using the magical vegetable. And I found one, perfect for a chilly, and very damp, by the sound of it, Autumn day. I’m really looking forward to lunchtime now! That’s it. I’m going to cook the Butternut Squash with Chilli & Creme Fraiche recipe for our lunch. Only 15 minutes preparation, and 50 minutes in the oven and pan, so it would make sense to make double the amount and freeze some. That’s definitely what I’ll be doing today. Cut the squash into large cubes, about 4cm/1 1/2inch across, then toss into a large roasting tin with half the olive oil. Roast for 30 mins, turning the cubes once during cooking, until golden and soft. While the squash cooks, melt the butter with the remaining oil in a large saucepan, then add the onions, garlic and three-quarters of the chilli. Tip the squash into the pan, add the stock and the creme fraiche, then whizz with a stick blender until smooth. For a really silky soup, put the soup into a liquidizer and blitz it in batches. Serve the soup in bowls with swirls of creme fraiche and a scattering of the remaining chopped chilli. When Autumn comes to East Yorkshire, I almost rejoice. Soups, for me, are the chance to use up some of our own Kitchen Garden produce – OK, I’ll admit it – Our Butternut Squash plant turned out to be a Courgette plant, and as I had a hankering to make Butternut Squash soup of some kind, I just had to buy one from Waitrose. But next year, I hope the Kitchen Garden will be fully up and running, so I will be thrilled to use my own Squash for Soup. 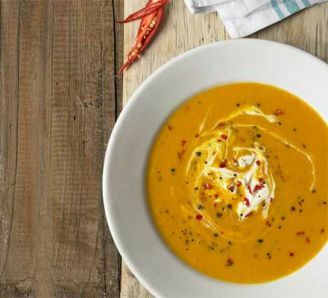 Hope you enjoy this warming Butternut Squash with Chilli and Creme Fraiche Soup. More soups to come, now the weather has changed. Keep watching! 15 Responses to Soup Time: Butternut Squash Soup with Chilli & Creme Fraiche Recipe. I’ll making this for Mrs Cleavage upon her return from scuba diving. It’ll warm her up no end. It looks SO yummy. I made this last night for my husband. Thank you for the recipe. So glad you (and Frou Frou) enjoyed the Butternut Squash soup Minty. Erik and myself do enjoy sharing our love of food with the world, whatever the season, and will enjoy it even more when we have a lovely kitchen to cook and play to our heart’s content. You must visit sometime. Regards, Astrid. I made this for my son Bentley. It’s a good job I made plenty as his friends turned up after Scouting practice. Those boys loved it. I med this for our lass. She loves it. Hot and thick. The cat loves it. We had this for lunch today. I had not roasted my squash before, it adds another dimension to the soup. Thank you Astrid. We are two happy lunchers with full tummies. Thank you Kitty. Glad the Scouts enjoyed the soup – my boys always loved homemade soup, especially when it was cold weather. Regards, Astrid. Not quite sure if Butternut Squash Soup with Chilli is the best food to give a cat – hope it was alright? But glad you liked it. Regards, Astrid. Heavens, this Butternut Soup recipe is really getting folk messaging me. Glad it went down well – will have to come up with something similar to keep you all writing. Regards, Astrid. We made this and it’s heavenly. I fed this to my ladies at our ladies group. They ALL like it very much. I’m now in charge of soups. So I must insist on some more recipes please. Hi Jenny, Glad you enjoyed the Butternut Squash Soup with Chilli and Creme Fraiche. More soups coming up this winter. Regards, Astrid. Hi Uzma, So glad your ladies group liked the soup. Hope your sojourn in Warsaw was enjoyable, and your ladies group behaved themselves. Bit of a culture shock maybe? More soups will be posted shortly – love making them for our lunch in Winter. Regards, Astrid. We made gallons of this on bonfire night. EVERYONE loved it.